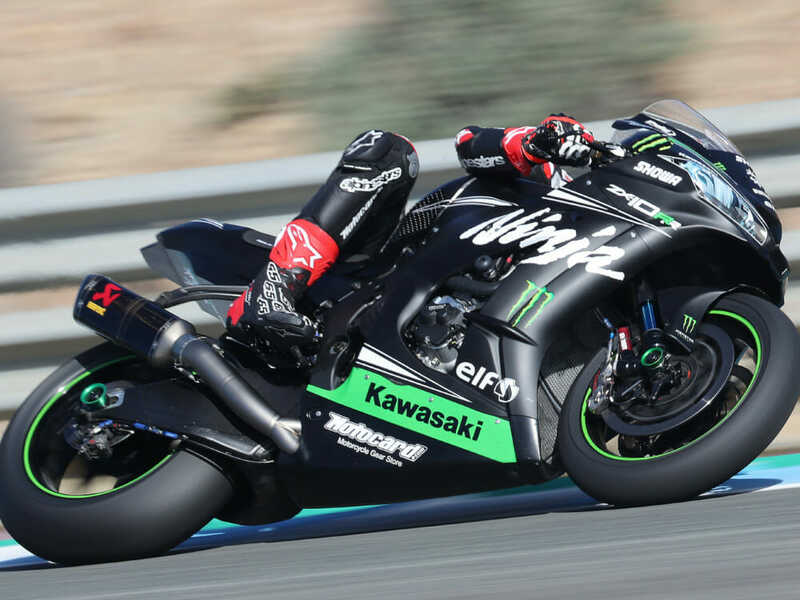 2019 Jerez World Superbike Test Results – Jonathan Rea (KRT) set the fastest WorldSBK time of the two-day test at Jerez de la Frontera, with his compatriot Alex Lowes (Pata Yamaha) running out second. The fastest time of all was set by HRC MotoGP test rider Stefan Bradl, on Michelins, but of all the WorldSBK riders in Spain, Rea took the best lap with a 1’39.160 – just 0.008 from Bradl. Lowes set a 1’39.372, on a qualifier, after testing a maze of new settings and some new parts. Lowes got through all the planed work and now heads to Portimao hoping to be equally fast there. Rea had tried a qualifying tire on the final day but he set a faster lap on a race tire, as did his teammate Leon Haslam, who posted a 1.39.502 for third place overall. Much better track conditions on day two, partly due to better weather conditions, allowed more riders to get settled in after what was a peculiarly grey and unsettling first day for some. The partially re-surfaced track improved on the racing line allowing the best times to drop as the new asphalt bedded in. Alvaro Bautista (Aruba.it Ducati) placed himself fourth on the all-new Ducati V4R, as he makes the transition from MotoGP to WorldSBK. According to the official Ducati team Chaz Davies suffered a muscle spasm in his back that prevented him from riding for much of the second day, and he ended up 10th. Toprak Razgatlioglu (Kawasaki Puccetti Racing) was impressive once again in fifth place but rookie WorldSBK rider Sandro Cortese (GRT Yamaha) overcame his first WorldSBK crash to post sixth best Superbike time, and be second fastest Yamaha rider on the final day. Michael van der Mark (Pata Yamaha) was seventh, and Marco Melandri (GRT Yamaha) eighth. The Barni Racing Ducati V4R of Michael Ruben Rinaldi took him to ninth on day two. Eugene Laverty placed his GoEleven Ducati 12th. With a transponder now fitted to his all-new machine, Tom Sykes (BMW SMR) fell at high speed and his bike was too badly damaged to complete a full day of action. He was uninjured but this crash left him 14th, and slower than his pace on the first day, when he had no transponder fitted. Sixteen riders attended the Jerez test, with only the official Moriwaki Althea Hondas of Leon Camier and Ryuichi Kiyonari missing so far. The fastest WorldSSP rider was Federico Caricasulo, on a Bardahl Evan Bros Yamaha, with a 1’42.529. Almost all of the Superbike teams that were at Jerez will relocate to Portimao now, for two more days of testing on Sunday and Monday – the 27th and 28th of January. Alex Lowes (Pata Yamaha) set the fastest lap of the first meaningful day of 2019 World Superbike track testing action at Jerez, with most of the main competitors in attendance. Only the Moriwaki Althea Honda team – the HRC side of the Althea garage – was missing, as they do their tests in Asia. According to his team, Lowes set the fastest day one time well into a run on track, with his 1’40.442 being 0.008 seconds faster than Rea’s best. Leon Haslam was third quickest, on the second official Kawasaki. Both KRT riders were late starters as the heavily resurfaced corners were quite ‘green’ to start, and remained so off-line as the 27 riders (from WorldSSP and one from MotoGP) gradually cleaned the new asphalt lap-by-lap. Still on a mostly 2018 spec machine, Toprak Razgatlioglu (Kawasaki Puccetti Racing) was fourth quickest, ahead of a run of three top Yamaha machines. Michael van der Mark, now with a much improved wrist injury not holding him back so much, was fifth, GRT Yamaha rider Marco Melandri sixth and his team-mate and new Superbike rider Sandro Cortese, seventh. Breaking the flow of WorldSBK riders, official HRC test pilot Stefan Bradl was eighth. After making a strong recovery after surgery to fix his much injured collarbone, Chaz Davies (Aruba.it Ducati) ended up top Ducati V4R rider, in ninth, with Alvaro Bautista tenth. Federico Caricasulo (Bardahl Evan Bros Yamaha) was top Supersport rider, 15th overall. Although running no transponders for technical reasons at the beginning of the day, Tom Sykes was reported to have set a 1’40.8 lap on his all-new BMW S1000RR, which if accurate would place him on the same pace as Leon Haslam, in third or fourth overall. Transponder issues should be overcome on day two, according to sources. One more day remains of the Jerez test, and then a further test will take place at Portimao in Portugal before the end of January.